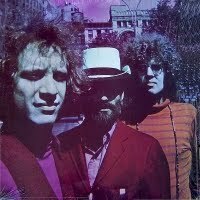 I don't know who the other two guys are, but the guy in front on the cover is Buzzy Linhart, who had a modest career on his own, as well as having played vibes on Hendrix's "Drifting" from Cry of Love. I would highly recommend Buzzy's album called "Music", which, IMHO, is a genuine lost classic. Not exactly psych, but some great funky rock with Buzzy's unique singin' and scattin'tying it all together. The Seventh Sons were known to back up Fred Neil on occasion. I own this cd since probably 6 or 7 years now, and I never come around to actually listen to that crap again ... One of the worst ESP releases. The Godz are GREAT compared to this. And I really don't like the Godz that much aswell. I also don't get the "Raga" connection. For me this stoned-out-of-our-minds simple guitar strumming doesn't have to do anything at all with a true Indian raga. Just a question of hype IMHO. WE were the first band that were into Indian ragas before anybody else ... yawn!